EAST SYRACUSE, New York - Like many high schools across the country, the audio console for East Syracuse-Minoa High School's auditorium needed to be replaced. Like most high schools these days, the available budget was limited. Sound contractor Brown Sound Equipment Corp. of East Syracuse, New York helped the school achieve its goal with the installation of a HARMAN Soundcraft Si Compact 32 digital console, which not only delivers better performance but was easier to install—and provided additional benefits not envisioned at the project's inception. 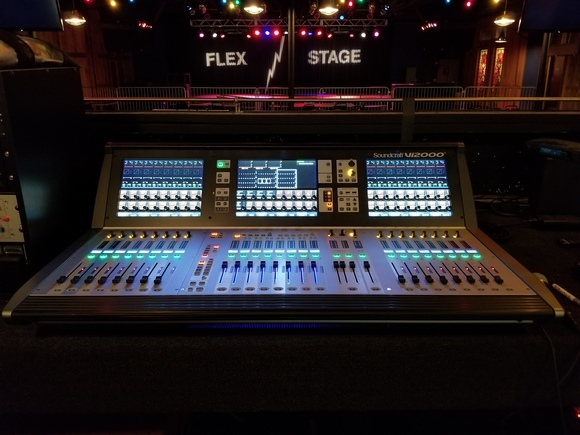 "Originally the district had budgeted for a 32-channel analog console—but they wanted to run 44 channels of wired and wireless mics from the stage," said Jim Messinger, co-owner of Brown Sound. "The original idea meant running lots of copper from the stage with fan-outs at the board, with the person at the console manually patching in whatever inputs were needed for each particular event. We knew there was a better solution out there." Working with David Dusman of Sigmet, Soundcraft's regional sales rep firm, Messinger took a look at the Si Compact 32. "It was apparent this was the right solution, was within our budget and would enable us to upgrade from analog to digital," Messinger said. The upgrade was part of an overall remodeling of the auditorium's audio capabilities, brought to fruition under the oversight of Amanda Thomas of King+King Architects, Syracuse, NY, Jon Helberg, electrical engineer at IBC Engineering in Rochester, NY and East Syracuse-Minoa High School music director Steve Culhane. In order to get 44 channels into the 32-channel Si Compact 32, Brown Sound also opted for a Soundcraft Compact Stagebox. 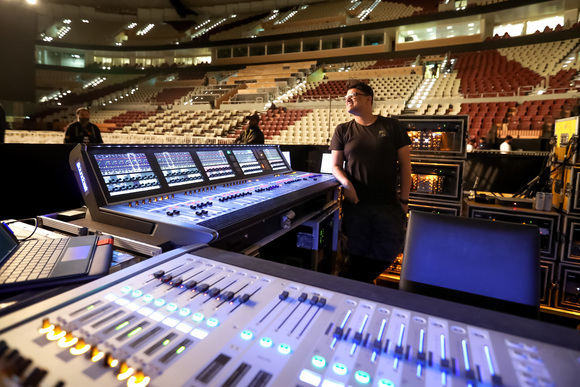 "We configured the Stagebox to have 48 inputs to send to the console, with eight returns for the BSS Soundweb London processors in the stage rack," Messinger noted. "It connects to the console via two Cat5 cables—a main and a backup—feeding into a MADI card in one of the Si Compact 32's expansion slots. 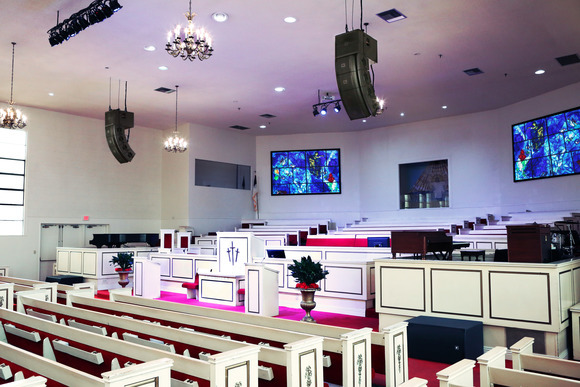 Using just the two Cat5 cables from the Stagebox to the console really simplified the installation—we were able to do a lot of the preliminary work off-site—and saved a great deal of time." The operator of the Si Compact 32 console can choose up to 32 of the microphones he or she wants to use—more than enough for any school event. Eight outputs from the console are fed into a Lexicon I-O/FW801S FireWire™ recording interface that's connected to an iMac® for 8-track live recording. "We knew the Si Compact 32 was small, but we didn't realize just how much space it saved until we put it in the Secure Cabinet locking rolltop cabinet that King+King had specified for the install," Messinger said. "The cabinet was specified before we had finalized the decision on the console and the Si Compact 32 just looked tiny in that huge space. However, this turned out to be an advantage. Originally we were going to place a combination CD/iPod® player and the I-O/FW801S under the console where they would have been hard to reach. Instead, I had room to place them above the console in a 'bridge' I constructed, which makes them a lot easier to access. There's also room for future expansion if needed." "The Si Compact 32 really makes sense for this kind of application," Messenger concluded. "It really eased the school's transition from analog to digital, it fit into our budget and it's more intuitive than any console we've used before."